Through this book, you will cultivate a clearly defined and active vision of how you want your creative / professional life to unfold and will learn to identify specifically what the obstacles are to achieving your goals. By identifying the primary keys to success & implementing powerful productivity tools into your daily routine, you will learn how to overcome all the barriers that have held you back up to this point. •	You will learn how to stay focused on your creative vision & adjust to constant change without compromising your trajectory. Growth requires putting down roots, and that requires committing to what you want to achieve years down the road. Without a grounded and practical approach towards attaining your goals, unforeseen events can undermine your efforts. •	You will revise your daily practices to become more and more effective at streamlining your goals. •	You will be guided to design the most powerful daily routine for you, catering to the unique landscape of your life. A powerful daily routine is one of the strongest tools to direct energy into constructive channels. •	You will discover effective ways to overcome your addictions, negative impulses, and destructive habits. Self-discipline has everything to do with ‘delayed gratification’, or resisting the urge towards immediate reward, knowing that waiting will yield a far greater reward in the future. Oftentimes, the people who struggle with actualizing their ideal life circumstances don’t necessarily lack willpower or have a poor work ethic. Most of the time, they simply don’t have a compelling enough vision to make their immediate sacrifice worthwhile. They haven’t invested enough emotional significance into the goal they are working towards. As a result, don’t have the emotional leverage necessary to push forward and make things happen. This book is designed to help you discover the emotional leverage necessary to create the breakthrough you’ve been looking for. We all are given a limited amount of time and energy in life to experience and accomplish the things our hearts desire. Self-discipline ultimately involves maximizing the time and energy we have available to us so that we are able to experience more and accomplish more of what we most want to do. 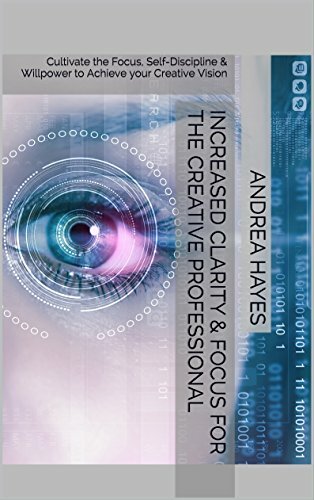 This is the Kindle version of Increased Clarity & Focus for the Creative Professional: Cultivate the Focus, Self-Discipline & Willpower to Achieve your Creative Vision that you can also download and read on your computer and mobile phone. Kindle books are DRM protected and therefore, unlike ebooks that are in PDF or ePUB format, you cannot read this ebook without the official Kindle apps.